Your contributions are NOT taxed upon withdrawals. Your earnings are taxed upon withdrawals. Your contributions are pre-tax, e.g. not taxed. Your contributions are taxed upon withdrawals. So you are paying taxes on your contributions regardless, the timing is just different. I am failing to see why would a person get an IRA, instead of just putting the same amount of money into a mutual fund (like Vanguard) or something like that. To keep it simple, I will keep the focus between a Trad IRA and a normal Taxable account (Roth's and 401(k) add more complications that make another problem). I will also assume, based on the question, that you aren't able to deduct the IRA contributions. Also, a Roth is better in every way than a non-deductible Trad IRA so the "backdoor Roth" mentioned in other answers is probably the way to go and this is more of an academic exercise. Ok, so why bother with the IRA if you're taxed anyway? Because you aren't taxed as you go! With a normal non-tax-advantaged account you have to pay taxes every year on any realized capital gains and dividends (including fund distributions). Because of the compounding nature of savings, delaying paying taxes is in your best interest. Now, this is a very simplified example. If you're more tax-conscious (i.e. more buy-and-holding), you can delay paying some of the long-term cap gains in the taxable account, but any short-term cap gains (including distributions from the underlying funds) will be at your marginal income tax rate. You can deduct losses in the taxable account, reducing some of the yearly tax pain. Whether that's worth it to you or anyone depends on some the assumptions in the simulation, especially effective tax rates, and growth rates, as well as any personal issues. Some people may be less likely to raid an IRA account, for example, than a normal account. Conversely, if you have a project coming up, you may need something a bit more liquid than an IRA. Your assumptions are flawed or miss crucial details. An employer sponsored 401k typically limits the choices of investments, whereas an IRA typically gives you self directed investment choices at a brokerage house or through a bank account. You can rollover unlimited amounts from a traditional 401k to a traditional IRA. This is a benefit that far exceeds the capabilities of someone without a traditional 401k who is subject to the IRA contribution limits. Your rollover capabilities completely gets around any statutory contribution limit. You can contribution, at time of writing, $18,000 annually to a 401k from salary deferrals and an additional $35,000 from employer contributions for a maximum of $53,000 annually and roll that same $53,000 into an IRA if you so desired. That is a factor. This should be counterweighed with the borrowing capabilities of a 401k, which vastly exceeds an IRA again. The main rebuttal to your assumptions is that you are not necessarily paying taxes to fund an IRA. Whether or not you can deposit to a Roth IRA, you are able to convert those deposits to A Roth account. In effect, you pay the tax going in (as with the regular brokerage account) but no tax on growth when withdrawn. The non-deductible IRA, on its own, holds little appeal, in comparison. "if you have 401k with an employer already, has the following features: Your contributions are taxed"
That's only true if you're a high income earner. For example, married filing jointly allows full deduction up to $99,000 even if you have a 401(k). "the timing is just different"
And that's a good thing, since if your retirement tax rate is less than your current tax rate, you'll pay less tax on that money. You are failing to consider the time value of money. Getting $1 now is more valuable to you than a promise to get $1 in a year, even though the nominal amount is the same. 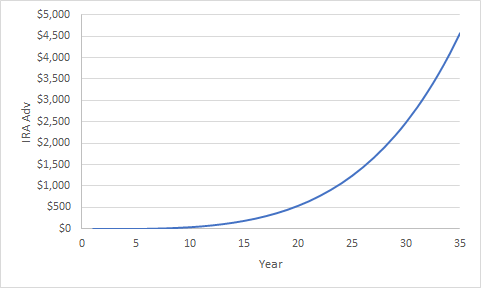 With a certain amount of principal now, you can invest it and it will (likely) grow into a bigger amount of money (principal + earnings) at a later time, and we can consider the two to have approximately equivalent value (the principal now has the same value as the principal + earnings later). With pre-tax money in Traditional IRA, the principal + earnings are taxed once at the time of withdrawal. Assuming the same flat rate of tax at contribution and withdrawal, this is equivalent to Roth IRA, where the principal is taxed at the time of contribution, because the principal now has the same value as the principal + earnings later, so the same rate of tax on the two have the same value of tax, even though when you look at nominal amounts, it might seem you are paying a lot less tax with Roth IRA (since the earnings are never "taxed"). With actual numbers, if we take a $1000 pre-tax contribution to Traditional IRA, it grows at 5% for 10 years, and a 25% flat rate tax, we are left with $1000 * 1.05^10 * 0.75 = $1221.67. With the same $1000 pre-tax contribution (so after 25% tax it's a $750 after-tax contribution) to a Roth IRA, growing at the same 5% for 10 years, and no tax at withdrawal, we are left with $1000 * 0.75 * 1.05^10 = $1221.67. You can see they are equivalent even though the nominal amount of tax is different (the lower amount of tax paid now is equivalent to the bigger amount of tax later). With a taxable investment which you will not buy and sell until you take it out, you contribute with after-tax money, and when you take it out, the "earnings" portion is subject to capital-gains tax. But remember that the principal + earnings later is equivalent to the principal now, which is already all taxed once, and if we tax the "earnings" portion later, that is effectively taxing a portion of the money again. Another way to look at it is the contribution is just like the Roth IRA, but the withdrawal is worse because you have to pay capital-gains tax instead of no tax. You can take the same numbers as for the Roth IRA, $1000 * 0.75 * 1.05^10 = $1221.67, but where the $1221.67 - $750 = $471.67 is "earnings" and is taxed again at, say, a 15% capital-gains rate, so you lose another $70.75 in tax and are left with $1150.92. You would need a capital-gains tax rate of 0% to match the advantage of the pre-tax Traditional IRA or Roth IRA. 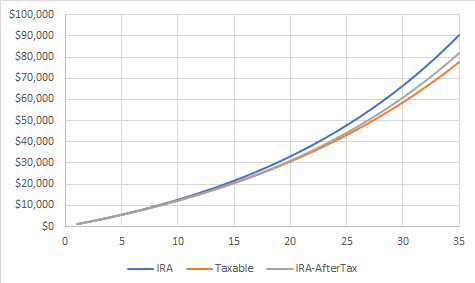 After-tax money in Traditional IRA has a similar problem -- the contribution is after tax, but after it grows into principal + earnings, the "earnings" part is taxed again, except it is worse than the capital-gains case because it is taxed as regular income. Like above, you can take the same numbers as for the Roth IRA, $1000 * 0.75 * 1.05^10 = $1221.67, but where the $471.67 "earnings" is taxed again at 25%, so you lose another $117.92 in tax and are left with $1103.75. So although the nominal amount of tax paid is the same as for pre-tax money in Traditional IRA, it ends up being a lot worse. Regarding the question you raise in the title of your question, why someone would get contribute to a Traditional IRA if they already have a 401(k), the answer is, mostly, they wouldn't. First, note that if you merely have a 401(k) account but neither you nor your employer contributes to it during the year, then that doesn't prevent you from deducting Traditional IRA contributions for that year, so basically you can contribute to one or the other; so if you only want to contribute below the IRA contribution limit, and don't need the bigger 401(k) contribution limit, and the IRA's investment options are more attractive to you than your 401(k)'s, then it might make sense for you to contribute to only Traditional IRA. If you or your employer is already contributing to your 401(k) during the year, then you cannot deduct your Traditional IRA contributions unless your income is very low, and if your income is really that low, you are in such a low tax bracket that Roth IRA may be more advantageous for you. If you make a Traditional IRA contribution but cannot deduct it, it is a non-deductible Traditional IRA contribution, i.e. it becomes after-tax money in a Traditional IRA, which as I showed in the section above has much worse tax situation in the long run because its earnings are pre-tax and thus taxed again. However, there is one good use for non-deductible Traditional IRA contributions, and that is as one step in a "backdoor Roth IRA contribution". Basically, there is an income limit for being able to make Roth IRA contributions, but there is no income limit for being able to make Traditional IRA contributions or for being able to convert money from Traditional IRA to Roth IRA. So what you can do is make a (non-deductible) Traditional IRA contribution, and then immediately convert it to Roth IRA, and if you did not previously have any pre-tax money in Traditional IRAs, this achieves the same as a regular Roth IRA contribution, with the same tax treatment, but you can do it at any income level. There is a process called a backdoor IRA. Contribute to a traditional IRA without tax advantages. So you are contributing after-tax income. Convert it to a Roth IRA immediately after contribution. It's post-tax money, so the conversion doesn't generate a tax impact. You now have effectively made a Roth IRA contribution in a year where technically you aren't eligible. You do not have to pay taxes on earnings with a Roth IRA. You are limited to the normal annual contribution to the IRA (Roth or traditional). If you don't convert your traditional IRA contribution to a Roth IRA, then you are right. That gains nothing except enhanced protection in bankruptcy. Only do this if you are taking advantage of the Roth rollover. I'm ignoring rolling over a 401k into an IRA, as that doesn't increase the amount you can contribute. This does. You can contribute the full $18,000 to the 401k and still make a full contribution to the backdoor IRA. This is the tax advantaged form of an IRA. This avoids double taxation. Let's assume that your investment can go into something with a 5% annual return and you pay a 25% tax rate (doesn't matter as it drops out). You are going to invest for thirty years and then withdraw. You initially have $1000 before taxes. You have $750 after taxes. Pay capital gains tax of 15% on the gain of $2491.46, or $373.72. You have the full $1000 to invest. Pay 25% tax on the whole thing, $1080.49. You now have $3241.45 (it is not an accident that this is almost the same as the amount before the capital gains tax in the example without an IRA). You avoided the $373.72 capital gains tax. Even though you paid a lot more tax, you paid it out of the gains from investing the original $250 that you would have paid in tax. This helps you even more if the capital gains tax goes up in the future. Or if your tax bracket changes. If you currently are in the 25% bracket but retire in the 15% bracket, these numbers will get even better in your favor. If you currently are in the 15% bracket and worry that you might retire in the 25% bracket, consider a Roth instead. It also avoids double taxation but its single taxation is at your current rate rather than your future rate. "I am failing to see why would a person get an IRA, instead of just putting the same amount of money into a mutual fund (like Vanguard) or something like that." Well, this isn't a meaningful distinction. The mutual fund may or may not be in an IRA. Similarly, the mutual fund may or may not be in a 401(k), however. So I'm going to treat your question as if it's "why would a person get a mutual fund (like Vanguard) or something like that in an IRA, instead of just putting the same amount of money into the same mutual fund in a 401(k)." Same mutual fund, same amount of money, narrowing your question to the difference between the two types of accounts, as stated in your question's title. Others have answered that to the extent that you really have no choice other than "pick which type of account to use for a given bundle of money", other than nobody having mentioned the employer match. Even if there were no other difference at all in tax treatment, it's pretty typical that 401(k) contributions will be matched by free money from the employer. No IRA can compete with that. But, that's not the only choice either: Many of us contribute to both the 401(k) and the IRA. Why? Because we can. I'm not suggesting that just-anybody can, but, if you max out the employer matching in the 401(k), or if you max out the tax-advantaged contribution limit in the 401(k), and you still have more money that you want to save in a tax-advantaged retirement account this year, you can do so. The IRA is available, it's not "instead-of" the 401(k). Actually, #1 and #2 are characteristics of Roth IRAs, not Traditional IRAs. Only #3 is a characteristic of a Traditional IRA. Whether you have a 401(k) with your employer or not makes absolutely no difference in how your IRAs are taxed for the vast majority of people. (The rules for IRAs are different if you have a very high income, though). You're allowed to have and contribute to both kinds of accounts. (In fact, I personally have both). Traditional IRAs are tax deferred (not tax-free as people sometimes mistakenly call them - they're very different), meaning that you don't have to pay taxes on the contributions or profits you make inside the account (e.g. from dividends, interest, profits from stock you sell, etc.). Rather, you pay taxes on any money you withdraw. For Roth IRAs, the contributions are taxed, but you never have to pay taxes on the money inside the account again. That means that any money you get over and above the contributions (e.g. through interest, trading profits, dividends, etc.) are genuinely tax-free. Also, if you leave any of the money to people, they don't have to pay any taxes, either. Important point: There are no tax-free retirement accounts in the U.S. The distinction between different kinds of IRAs basically boils down to "pay now or pay later." Many people make expensive mistakes in their retirement strategy by not understanding that point. Please note that this applies equally to Traditional and Roth 401(k)s as well. You can have Roth 401(k)s and Traditional 401(k)s just like you can have Roth IRAs and Traditional IRAs. The same terminology and logic applies to both kinds of accounts. As far as I know, there aren't major differences tax-wise between them, with two exceptions - you're allowed to contribute more money to a 401(k) per year, and you're allowed to have a 401(k) even if you have a high income. (By way of contrast, people with very high incomes generally aren't allowed to open IRAs). A primary advantage of a Traditional IRA is that you can (in theory, at least) afford to contribute more money to it due to the tax break you're getting. Also, you can defer taxes on any profits you make (e.g. through dividends or selling stock at a profit), so you can grow your money faster. What you're describing is a non-deductible traditional IRA. That is what happens when your employer 401K or your high income disqualifies gou from using a traditional IRA the normal way. Now let's be clear on the mechanism behind the difference. There's an axiom of tax law that the same money can't be taxed twice. This is baked so deep into tax law that it often isn't even specified particularly. The IRS is not allowed to impose tax on money already taxed, i.e. The original contribution on an ND Trad IRA. So this is not a new kind of IRA, it is simply a Trad IRA with an asterisk. **But then, some say so are deductible traditional IRAs when compared to the Roth. The real power of an ND Trad IRA is that it can be converted to Roth at all income levels. This is called the "Roth Backdoor". It combines three factors. it's not illegal to contribute to a traditional IRA at high income levels, it just isn't tax deductible. The same money can't be taxed twice. Contribute to an ND Trad IRA, stick it in a money market/sweep fund, and a week later convert to Roth, pay taxes on the 17 cents of growth in the sweep fund since the rest was already taxed. The net effect is to work the same as a Roth contribution - not tax deductible, becomes a Roth, and is not taxed on distribution. If you already have traditional IRA money that you contributed that wasn't taxed, this really screws things up. Because you can't segment or LIFO your IRA money, the IRS considers it one huge bucket, and requires you draw in proportion. EEK! Suppose you contribute $5000 to an IRA in a non-deductible mode. But you also have a different IRA funded with pretax money that now has $45,000. As far as IRS is concerned, you have one $50,000 IRA and only $5000 (10%) is post-tax. You convert $5000 to Roth and IRS says 90% of that money is taxable, since it's the same pool of money. You owe taxes on all of it less the $500 fraction that was pre-taxed, and $4500 of already-taxed IRA remains in the account. The math gets totally out-of-hand after just a couple of conversions. Your best bet is to convert the whole shebang at one time -- and to avoid a monstrous tax hit, do this in a gap year. So many complicated answers for a straight forward question. First to this point "I am failing to see why would a person get an IRA, instead of just putting the same amount of money into a mutual fund..."
An IRA can be invested in a mutual fund. The IRA benefit over standard mutual fund is pre-tax contribution lowering your current tax liability. The advantage of an IRA over a 401k is control. Your employer controls where the 401k is invested, you control where your IRA is invested. Often employers have a very small number of options, because this keeps their costs with the brokerage low. 401k is AMAZING if you have employer matched contributions. Use them to the maximum your employer will match. After that OWN your IRA. Control is key when it comes to your money. On IRA's. Buy ROTH first. Contribute the calendar maximum. Then get a traditional. The benefit of ROTH is that you already paid taxes on the contribution so your withdrawal is not taxed AND they do not tax the interest earned like they do on a standard mutual fund. The purpose is to be a racket. Assuming you're in the same tax bracket, you pay exactly as much tax later as you would now. If you're in a higher bracket, you pay more! And even if you pay less (assuming they don't change tax law before you retire) you give up direct control of your assets in exchange for a promise which may not be honored. Not the answer you're looking for? Browse other questions tagged united-states 401k ira retirement-plan or ask your own question. When do you actually pay taxes on Roth IRA contributions? Which earnings can be withdrawn when making an in-service withdrawal from a 401k?